round for a 3.5mm cable through which I could breakout the function pin. Surprisingly I found one with an old nokia brick phone, after dissmanteling the button and mic I soldered on a SIL and started messing round with it. At first I had no luck with the function button which literally grounded the function pin throuh a switch. However then I realised the mic would offer some resistanve normally, so I measured the resistanc of my HTC headphones. It measured 800 ohms so I set up a variable resistor in its place. Succes! I can now control the track and play pause on any compatible device. 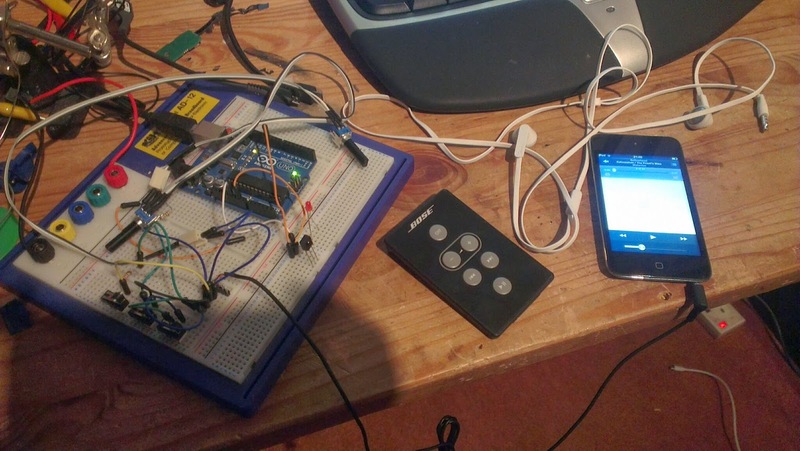 Next stage is to buy a digital potentiometer to allow me to control the volume and the remote will be fully functional.